The best Alexa commands to use in your smart home. Read my list of Alexa commands that is easily organized to find what you need fast. You will be surprised with everything you can do with a simple command to your Echo Dot! Amazon is constantly expanding the capabilities and the list of Alexa commands you can use with your Echo devices. There are even more Echo commands available with the available 3rd party skills. The list of Alexa commands in this article are the commands I find most useful in my smart home. This list will be updated as new features are added. Tell me your favorite commands in the comments below! Alexa is the perfect voice for your smart home. It is incredibly convenient to control your smart home devices by voice. Use this command to add your smart home devices to your Amazon Alexa. Alexa will take about 20 seconds to search for any smart home devices in your home. Alexa is great as an alarm clock. You can easily set alarms for the exact days and frequency that you want. Additionally, you can set the sound or music that you want to play when the alarm sounds. Alarms will continue to sound until you snooze or cancel them. Example: Alexa, turn on Living Room Lamp. Example: Alexa, turn on lights. Learn how to set up Alexa context aware lighting. Example: Alexa, set Family Room Lamp"to 50%. Set your dimmable lights from 0% - 100% by voice. Example: Alexa, set Fireplace Lights to Blue. Control the color of capable lights with your voice. Control your Nest or Ecobee smart thermostat by voice with Alexa. Voice control of your thermostat really adds to the convenience of having a smart thermostat. Example: Alexa, set home to 68. Example: Alexa, what is the home temperature. Alexa will tell you the current temperature recorded by the thermostat. Example: Alexa, increase home temperature. Alexa will increase the temperature by 2 degrees. Example: Alexa, set home to heat. Alexa can change your thermostat between heat and cool modes. Alexa, what is the [thermostat name] set to? Example: Alexa, what is the home set to? Alexa will tell you the current temperature setting of your thermostat. Alexa can securely control some smart door locks. You need to setup a secure PIN to that must be spoken before Alexa will open or close your lock. Example: Alexa, unlock the Front Door Lock. Alexa, is the [lock name] locked? Example: Alexa, is the Front Door Lock locked? Alexa will tell ​you the current status of your front door lock. Alexa can be used to control some smart home security systems and cameras. Security system changes require a secure PIN to be spoken before changing the alarm status. Example: Alexa, show the front door. Alexa will display the camera on your Show, Spot or Fire TV. Example: Alexa, hide the front door. Alexa will hide the video feed on your device. Alexa will arm or disarm your Ring alarm with a security code. Example: Alexa, set Ring to away. You can control home or away security settings with Ring. Alexa will tell you the current status of your Ring alarm. Here is a list of other smart home commands you can ask with your Amazon Echo. A lot of these commands require a smart home controller integrated with your Amazon Echo. I recommend using SmartThings. Example: Open the living room blinds. Alexa can open or close your smart blinds. Alexa, is the [sensor name] open? Example: Alexa, is the garage door open? Alexa can tell you the status of a door sensor. Alexa, what is the temperature of [sensor name]? Example: Alexa, what is the temperate of back garage door? Alexa can tell you the temperature recorded by any smart device. Example: Alexa, trigger find my phone. Alexa can run your IFTTT recipes with a voice command. Alexa, turn on party time. Alexa can trigger scenes from your smart home controller. Alexa, turn on TV Lighting. Set up a custom phrase and list of actions to perform with Alexa. Learn more with my Alexa custom phrase guide. Example: Alexa, set an alarm for 6 AM. Example: Alexa, set an alarm on Sunday for 10 AM. Example: Alexa, set an alarm every weekday for 7 AM. Alexa will cancel your current alarm or ask you which alarm to cancel if you have multiple. Alexa will snooze your alarm for 9 minutes. Example: Alexa, wake me up to Classical music at 6 AM. Wake up to your favorite music! Alexa timers count down from a stated time frame. When the time is up, Alexa will notify you though your Echo device with a sound notification that you can choose. Alexa will continue to alert you until you dismiss the timer by saying "Alexa, stop". Alexa timers are great for cooking. For example, you can set a "steak timer" for 4 minutes and a "potato timer" for 15 minutes. When it is time to flip the steaks, Alexa will say, "Your steak timer is done." Example: Alexa, set a timer for 8 minutes. Example: Alexa, set a pizza timer for 20 minutes. Alexa, how much time is left? Alexa will tell you how much time is left on the timer. Example: Alexa, how much time is left on the pizza timer? Alexa will tell you how much time is left on a specific timer. Example: Alexa, cancel the pizza timer. Alexa will cancel, stop or resume your timer. Example: Alexa, set a sleep timer for 25 minutes. Alexa will turn your music off after the time is up. Alexa reminders are a lot like alarms except you can give them a custom name and you don't have to tell Alexa to stop the reminder. Alexa will automatically stop the reminder after two notifications. For example, if you set a "flip the hamburgers" reminder then Alexa will say this is your reminder, flip the hamburgers. Example: Alexa, remind me to "Walk the Dog" in 45 minutes. Example: Alexa, set a "the bus is coming soon" reminder every day at 7:56 AM. Alexa will say...this is your reminder, the bus is coming soon at 7:56 AM. Alexa, what are my reminders? Alexa will tell you what reminders you have set. Alexa, what are my reminders for [day]? Example: Alexa, what are my reminders for tomorrow? Alexa will tell you what reminders you have set for a specific day. Example: Alexa, cancel "Walk the Dog" reminder. Alexa will cancel the specific reminder. Standard Alexa commands that work with all music. Alexa will play or resume your music. Alexa will stop or pause your music. Alexa will increase or decrease the volume by 1 unit. Example: Alexa, set volume to 6. Volume can range from 1 - 10 on your Echo. Example: Alexa, play Imagine Dragons. Example: Alexa, play 60s music. Example: Country, Rock, 60s Music, Popular Music, Holiday Music. Example: Alexa, play relaxing music. Music for how you feel - Relaxing Music, Sad Music, Exciting Music. Alexa will start or stop blocking songs with explicit lyrics. Example: Alexa, set a sleep timer for 15 minutes. Example: Alexa, turn this off is 15 minutes. Example: Alexa, play holiday music everywhere. Alexa will play the music on all of your Echo devices or in the multi-room music groups that you set up in the Alexa app. Alexa can be linked with several music services including: Spotify, Pandora, iHeartRadio, TuneIn, SiriusXM, etc. You can specify which service to use with the commands listed below. Make sure you link your music service account in the Alexa settings. Example: Alexa, play rock music on Pandora. Example: Alexa, play Jason's playlist on Spotify. Example: Alexa, play the Dave Ramsey Channel on iHeartRadio. Alexa has a built in equalizer to fine tune the sound on your device. Currently, you can control specific EQ Bands or pre-defined EQ Modes. Example: Alexa, set Base to 7. Example: Alexa, set Movie Mode. Example: Alexa, set Base to 5 on Basement Echo. Example: Alexa, set Movie Mode on Soundbar. Alexa can tell you information about the music you are playing. Just ask one of the commands while listening to your music. Alexa, what is the name of this song? Alexa will tell you the name of the song currently playing. Alexa, who is this band? Alexa will tell you the name of the bad currently playing. Alexa, who is the lead singer of [band name]? Example: Alexa, who is the lead singer of Guns N' Roses? Alexa can play or read your audio books on Audible or Kindle. Just use the audio book playback commands listed below. Example: Alexa, play "Think and Grow Rich" on Audible. Alexa will continue reading your current audiobook. Alexa will skip the current chapter and start playing the next. Example: Alexa, go to chapter 7. Alexa will start playing the chapter you choose. Example: Alexa, go back 45 seconds. Alexa will go back or forward the time you specify. Example: Alexa, play the Kindle book "The Total Money Makeover". Alexa will change the speed at which the book is read. Alexa, what are my books? Alexa will give you a list of your audio books. Alexa can control the content on your Fire TV, Fire TV Stick or Fire TV Edition TV. You can use the Alexa voice remote or you can link an Amazon Echo device to your Fire TV. Here is a list Alex Fire TV commands you can use. This is a list of general playback commands that work with all Fire TV content. Alexa will pause the content that is playing. Live TV will pause based on how much memory your device has to record the content. Alexa will continue playing your content. Example: Alexa, rewind 5 minutes. Example: Alexa, fast forward 1 minute 30 seconds. Alexa will re-start the content from the beginning. Alexa can help you find and watch your favorite movie. Use the Fire TV commands below for movies. Example: Alexa, play the walking dead on Hulu. Alexa will play the show or movie on the app you choose. Example: Alexa, search "Back to the Future"
Alexa will show you all options for watching the movie / show. Example: Alexa, search for Property Brothers on Playstation Vue. Alexa will show you all available episodes of your show. You can watch Live TV on for Fire TV using a Fire TV Recast, a Fire TV Edition TV or an application that includes live TV (Playstation Vue, Direct TV Now, Hulu, etc.). Example: Alexa, tune to ABC. Example: Alexa, tune to HGTV on Playsation Vue. Alexa will play the live station from the application you choose. The Fire TV Cube and Fire TV Edition TVs have additional Alexa commands. You can use these Fire TV commands through the Alexa remote or through a linked Amazon Echo device. The Fire TV Cube allows you to control all your existing TV and entertainment equipment with a built in RF emitter. Example: Alexa, turn on Fire TV. Example: Alexa, set Fire TV volume to 27. Example: Alexa, turn up Fire TV volume. Alexa will increment the volume up or down. Alexa will mute your Fire TV. You can un-mute the TV by changing the volume or saying "un-mute" Fire TV. Example: Alexa, switch to DVD. Alexa will switch the TV input. Alexa will open the Amazon Fire TV guide. You can link multiple types of calendars to Alexa including: Google, Apple, Microsoft Office 365 and Microsoft Outlook.com calendars. Once your calendar is linked to your account, you can review and control events on your calendar with Alexa. This is a list of general list of calendar commands to use with your Alexa device. Alexa, what is on my calendar / schedule [day]? Example: Alexa, what is on my schedule tomorrow? Day = Today, Tomorrow, Next Wednesday, July 4th, etc. Alexa will speak or show you the events on your linked calendar. Example: Alexa, add "lunch with mom" to my calendar. Alexa will prompt you for more details for the event. Example: Alexa, cancel my 4 PM event. Example: Alexa, move "lunch with mom" to 12:30 PM. Alexa can manage all of your lists with voice commands. You can create shopping lists, to-do lists, packing lists of any other type of list. Your lists are available in the Alexa app or you can link your favorite application to sync your lists. Currently supported list apps include: Todoist, Any.do, AnyList, Cozi Lists, and Picniic. When you add an item to a linked list then it will show up in your app. 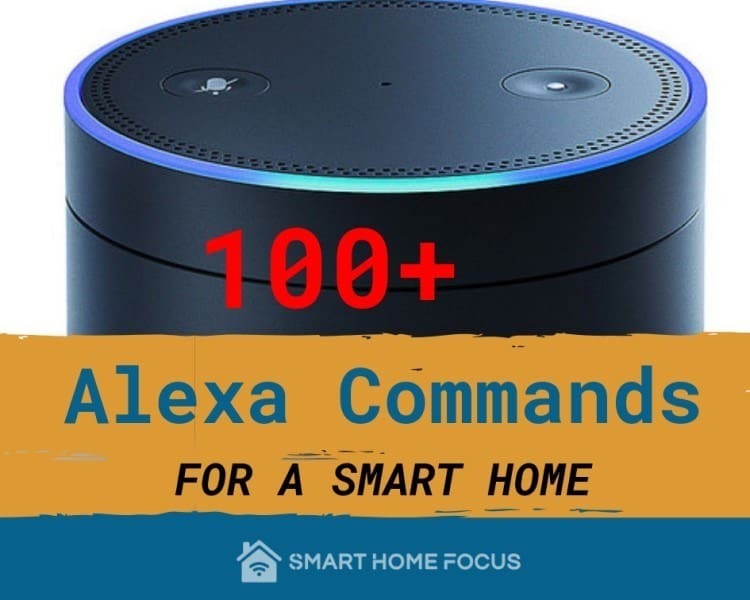 This is a list of general list of list commands that you can use with your Alexa device. Example: Alexa, add milk to my shopping list. Example: Alexa, what is on my to-do list. Alexa will read the current items on your list. Alexa will ask you to give a name to your new list and then will allow you to add items to the list. Alexa, clear my shopping list. Alexa will remove all items currently on the list. You can get voice only deals or easily reorder products using your Amazon Echo. Amazon has product deals and discounts that are only available through your Alexa device. Voice shopping is most useful for reordering products that you don't need to research. Don't forget to setup a PIN in the Alexa app so products aren't accidentally ordered. Here is a list of commands you can use to shop Amazon with Alexa. Example: Alexa, reorder breakfast bars. Alexa will look at your previous orders and confirm which item you want to reorder. Example: Alexa, order a "black Echo Dot". This is mostly useful when Amazon runs voice only deals that you have already researched. Example: Alexa, add "Sonos Play 1" to my cart. Alexa will add the item to your cart so you can review and purchase online. Alexa will give you an update on the status of your order. This works for all orders you have placed with Amazon (voice or online). Alexa will give you a list of special deals. Example: Alexa, check prices for dog food. Alexa will tell you current prices listing product you have previously ordered first. Alexa allows you to communicate with other people in several ways. This includes communication between two or more Echo devices and calls between your Echo and a phone. You will find in home communication is very useful if you have more than one Echo device. Alexa announcements allow you to broadcast a message to all the Alexa devices in your home. This feature is great for telling the kids it's time for dinner! Alexa will prompt you for additional details of your announcement. Example: Alexa, tell everyone "its time for dinner". Alexa will announce your message on all devices and sometimes add a special sounds such as a dinner bell. Drop in allows you to communicate from one Alexa device to another. This is great to use as a home intercom system. You can also set up your device to allow a drop in outside of your home with certain contacts. The device will chime when connected and the ring around the Echo will continue to flash green. Example: Alexa, drop in on basement Echo dot. Alexa will contact your Echo to the basement Echo. Alexa will hang up the drop in discussion. You can call most mobile and landline numbers in the US, Canada and Mexico using your Amazon Echo device. Emergency service numbers are not currently supported (911, 411, etc.). The ring on the Echo device will flash green when someone is calling or the call is connected. Alexa will call the number you speak. You have to include the area code. Alexa will answer an incoming call to your device. Alexa will hang up a currently active call. Alexa can send a voice message to other Echo devices or to a phone through the Alexa app. You can also send an SMS text message through your phone using your Alexa device (Android 5.1 and newer). When you have a message or notification, your Amazon device will flash yellow or you will receive a notification on your phone. Your Echo device and will prompt you for additional details. Alexa will send your voice recording to the Echo device or Alexa app of your contact. Example: Alexa, send a message to Mom. Alexa will send an SMS text using your phone and will prompt you for additional details. Example: Alexa, send a text to Dad. Alexa will play your voice message. Your device will flash yellow if a new message was received. Alexa will play your notifications. Alexa can tell your the time and weather for any location. This is a great item to include in your flash briefings. Alexa will tell you the current local time. Alexa, what time is it in [location]? Example: Alexa, what time is it in London. Alexa will tell you the sunset time for your location. Alexa, what is the forecast? Alexa will give you general weather information for the day. Alexa, what is the forecast for [day]? Example: Alexa, what is the forecast for Friday. Day = Today, Tomorrow, Next Friday, This Weekend, January 1st, etc. Alexa, what is the forecast in [location]? Alexa, what is the forecast in Miami? Alexa will give you weather information for the location your specify. Alexa, what is the extended forecast? Alexa will give you weather information for the next 7 days in your location. Alexa, will it rain / snow [day / period]? Example: Alexa, will in rain this weekend? Alexa will tell you the probability of rain during the time you specify. Alexa, will it be windy [day]? Example: Alexa, will in be windy tomorrow? Alexa will tell you how windy it will be on the day you specify. Alexa can update you on the current news. You can set up your favorite news sources in the Alexa app. Alexa will play all updates you setup in your flash briefing. Alexa will play the top news headlines for you. Amazon is constantly adding new features and commands you can ask Alexa. Here are a few general commands that are commonly used. Alexa, what are the hours for [local business name]? Example: Alexa, what are the hours for Best Buy? Alexa will tell you the business hours for a local business. Alexa will tell you a kid friendly joke. Alexa will give you heads or tails. Example: Alexa, pick a number between 1 and 100. Alexa will give you the number rolled. Alexa, what is [your math problem]? Example: Alexa, what is 10 x 5 + 20? Example: Alexa, can dogs eat chocolate? Ask Alexa any question. Alexa is constantly learning and can answer most fact based questions. This one is easy for my family. The main lights in the kitchen and living room turn off. The lamps and fireplace lights come on at 40% dim level. The lamps and fireplace lights turn to a blue hue, which is perfect for watching TV. This is easy to setup with an Amazon routine and Philips Hue lights. See the guide below for more information. Create your own custom voice command with Alexa! Create a phrase and choose what Alexa will do when it is said. A custom Amazon Alexa command is a great way to control you smart lights​ with your voice. This guide will show you how to create an Alexa routine with a custom voice command in the Alexa app.